Ireland has a worldwide reputation as a significant financial centre for international banking, funds and insurance. The sector includes companies that provide financial products and services. It comprises of commercial banks, insurance companies, non-banking financial companies, cooperatives, pension funds, mutual funds and many other small financial entities. Banking includes core banking activities, retail, private, corporate, investment and credit cards, while Insurance covers both life (Living) and non-life (Non-living) insurance cover products. Financial services encompasses stock-broking, mutual funds, International Financial Services and the significant aircraft leasing sector that has developed in Ireland. 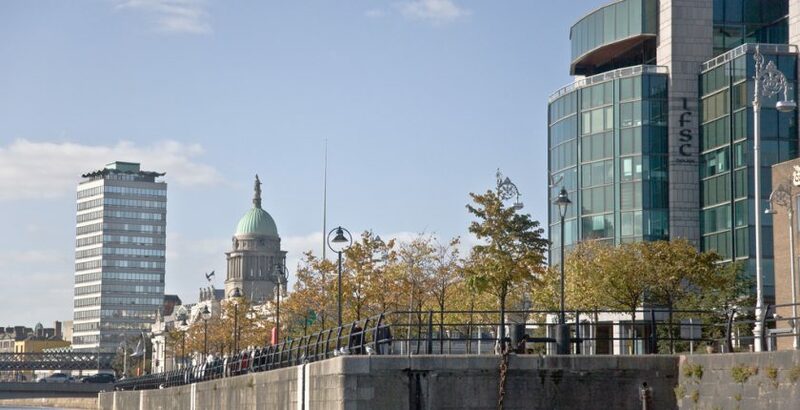 We are all familiar with the High Street banks and building societies in every town and city in the country, but Dublin’s IFSC is the hub of the financial services and financial technology activity in our capital city, and of financial services business activity in Ireland. Half of the top 50 banks in the world, including Citigroup, JP Morgan, BNP Paribas and Bank of America/Merrill Lynch are located in Ireland. 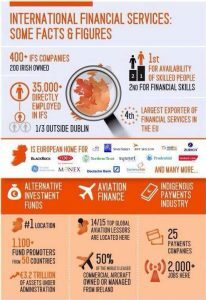 Over 450 international financial services companies operate within the IFSC. However, they can also be found located around the country. These include BNY Mellon in Wexford and Statestreet in Kilkenny. More than 100 Irish companies also provide technology and associated support services to the sector. In addition, there is a significant number of indigenous financial services and insurance organisations operating in Ireland such as Fexco, FBD, IFG, AIB Bank, Bank of Ireland, Abbey Capital, EBS, Irish Life & Permanent, VHI, Liberty Insurance and Quintillion. Many young people enter careers in the banking sector after graduating in business, accountancy, economics and financial studies. Others start working in the area on leaving school and build qualifications as they gain experience. The financial services industry has a long history of attracting energetic and ambitious people. A career as a Financial Investment Manager or Dealer may involve working for a large multinational company or a smaller player with high growth prospects. In Corporate Finance, responsibility can come fast and this is where your problem-solving skills will be put to use quickly. A degree in Finance or Accountancy would be the expected minimum qualification for these positions. The work of an Investment Manager or Trader tends to be a very pressurised and competitive career, demanding a high level of concentration and in-depth knowledge of the market. If you like lots of responsibility and the pressure that goes with it, this career may be worth considering. Most investment banks and corporations have their own in-house training for Traders and Investment Managers. It usually takes at least 2 years on-the-job training before you gain enough experience and expertise to be given the authority and freedom to trade on behalf of your bank or corporation. The International Financial Services (IFS) industry in Ireland is undergoing a process of evolution. This sector is a sub-sector of financial services and has grown dramatically in the past 20 years. IFS companies continue to view Ireland as an attractive investment proposition. All of our consultants stay on top of industry news so if you want to learn more, reach out to one today. E-mail your query to info@questrecruitment.ie or use the contact form here.